J. Chem. Phys., 141, 134311, 2014. The present combined theoretical and experimental investigation concerns the single photoionization of gas-phase acetyl cyanide and the fragmentation pathways of the resulting cation. Acetyl cyanide (AC) is inspired from both the chemistry of cyanoacetylene and the Strecker reaction which are thought to be at the origin of medium sized prebiotic molecules in the interstellar medium. AC can be formed by reaction from cyanoacetylene and water but also from acetaldehyde and HCN or the corresponding radicals. 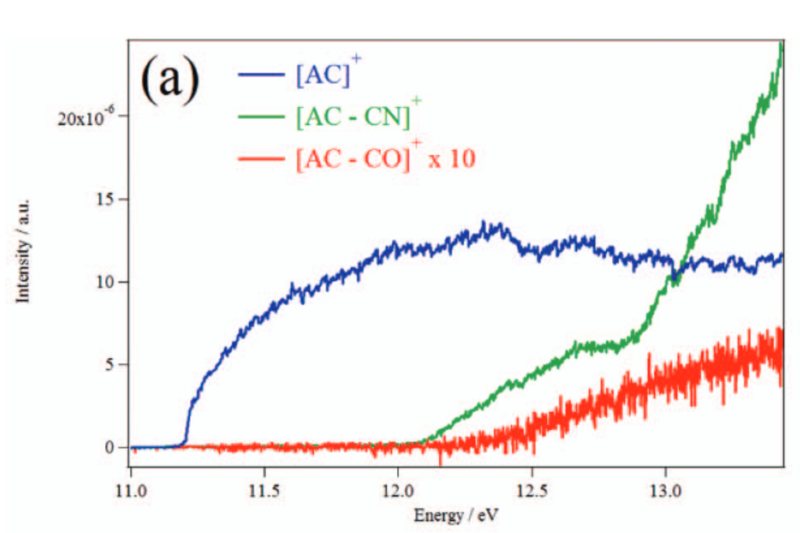 In view of the interpretation of vacuum ultraviolet (VUV) experimental data obtained using synchrotron radiation, we explored the ground potential energy surface (PES) of acetyl cyanide and of its cation using standard and recently implemented explicitly correlated methodologies. Our PES covers the regions of tautomerism (between keto and enol forms) and of the lowest fragmentation channels. This allowed us to deduce accurate thermochemical data for this astrobiologically relevant molecule. Unimolecular decomposition of the AC cation turns out to be very complex. The implications for the evolution of prebiotic molecules under VUV irradiation are discussed. (C) 2014 AIP Publishing LLC. J. Mol. Spec., 315, 196, 2015. Aminoacetonitrile (AAN) is a key compound in astrochemistry and astrobiology. We present a combined theoretical and experimental investigation concerning the single photoionization of gas-phase AAN and the fragmentation pathways of the resulting cation. At present, we measured photoelectron photoion coincidence (PEPICO) spectra in the 9.8–13.6eV energy regime using synchrotron radiation as exciting light source. 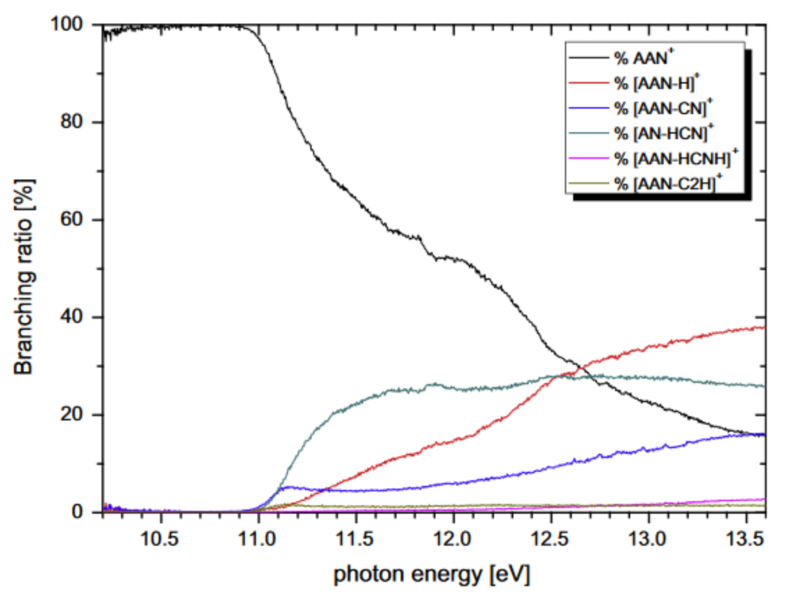 In order to interpret the VUV experimental data obtained, we explored the ground potential energy surface (PES) of AAN and of its cation using standard and explicitly correlated quantum chemical methodologies. This allowed us to deduce accurate thermochemical data for this molecule. We also determined, for the first time, the adiabatic ionization energy of AAN to lie at AIE=(10.085±0.03)eV. The unimolecular decomposition pathways of the resulting AAN+ parent cation are also investigated. The appearance energies of five fragments are determined for the first time, with 30meV accuracy. Interestingly, our work shows the possibility of the formation of both HCN and HNC isomeric forms. The implications for the evolution of prebiotic molecules under VUV irradiation are briefly discussed.